Last year, I became fixated on a girl called Uffie. She’s a Paris based, electropop/hip-hop/dance artist with such a unique sound. I quickly scoured the Internet to find everything she has ever created. Once I became saturated by everything that is Uffie, I wanted to find other artists with that similar electropop / hip-hop sound. Pandora came to my rescue. Once you sign up for Pandora, you create radio stations based on artists you currently like. So naturally, for the first artist, I put in “Uffie” and it played a song by her. Then, it started to link to other artists such as Fannypack and Peaches with that same sort of sound that I was yearning for. I fell in love with Pandora, and it is one love affair that I don’t see ending anytime soon. Another popular service for music recommendation and tracking is Last.FM. I have been on Last.FM since 2005, but lost interest in it due to the fact that I began listening to most of my music streaming online. Winamp couldn’t send track information to Last.FM about the songs I was listening to through Shoutcast. Fast forward 4 years. Last night, I stumbled across an open source app for Pandora called OpenPandora. 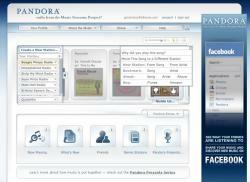 It allows you to listen to Pandora without a browser open, as well as a lot of other cool features. There was one feature that made me happier than all the rest, Last.FM integration. So now, if you visit my Last.FM profile, you will see all the songs I am currently listening to on Pandora. It’s a great mashup. FYI, in my sidebar, you will now see a “listening to” section that’s a feed from last.fm. It’s a WordPress plugin called Last.FM Recent Album Artwork, and the best plugin I have tried so far with Last.FM integration. I definitely recommend it. Monday, February 23rd, 2009 at 11:36 am	in Music. I looooooooooove the music I listen to so finding more artist close to what I already list to is magical! I’ve never heard of Pandora so many thanks for the mention!!! Oh yea, I heard about that. Music copyrights are a pain! In such a global culture, it’s a shame that record companies can’t look at the bigger picture… the music would be heard by a broader audience.